What is AB Tasty ? How much does AB Tasty cost ? 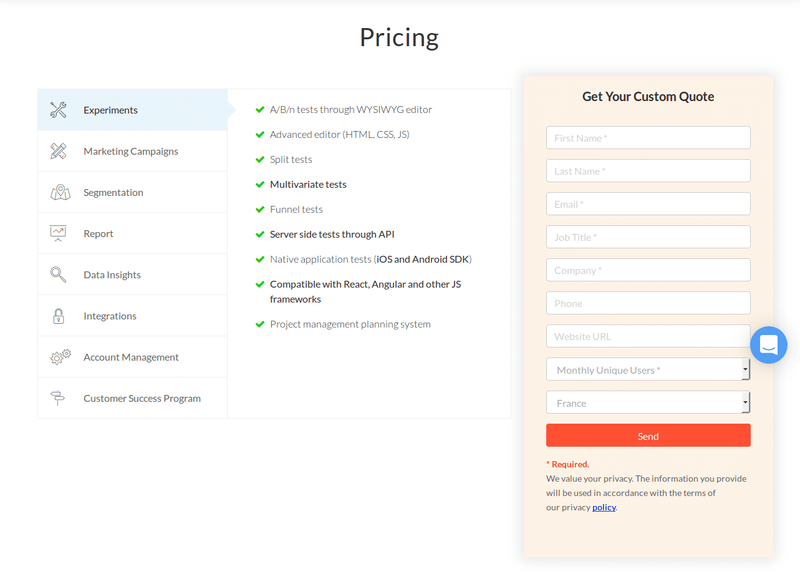 AB Tasty provides a custom pricing for their software. "AB Tasty is the future of CRO platforms. " Bringing on a new platform is always a scary endeavor. One of the most important things, in my opinion, is finding a company who can be in a partnership with. AB Tasty does one thing great and that's putting the customer first at the core of their operation. From customer support to product development, AB Tasty is setting a new standard for how organizations with cloud-based software applications. AB Tasty is still working on a lot of aspects of their platform. While this may not be ideal for everyone seeking a CRO platform, its promising about the future direction. The platform gives you all the basics and more. As is true with any growth company there are going to be some nuances. What's important is how the company is strategically planning to overcome those obstacles. 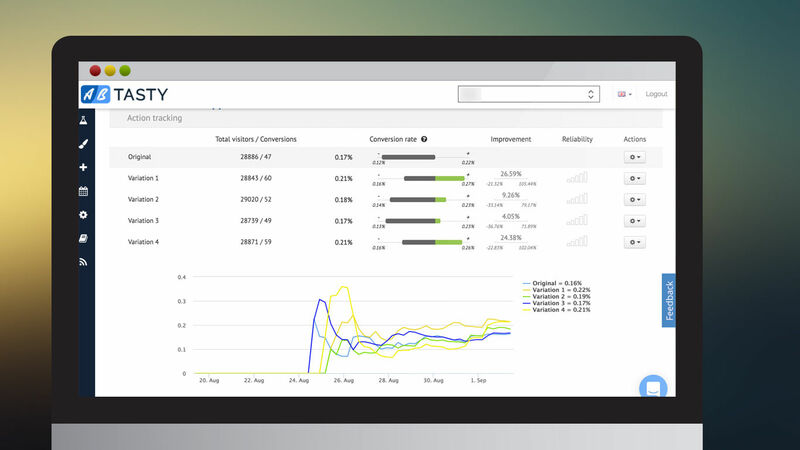 Evolve uses AB Tasty to deeply understand the quantitative aspects of user behavior. We then combine those findings with qualitative findings to strategically design experiments that are run in AB Tasty. Data should always be a driving factor for experimentation and AB Tasty is at the core of our Arsenal for making those decisions. "Robust and relatively easy platform to use"
1) The customer service is incredible and the support team is very knowledgeable in answering a variety of questions. They are very patient and willing to work with you to make sure you understand how to use features and widgets. 3) Widgets are extremely useful and save a lot of time when running tests. More documentation on what would need tech/dev efforts and what you can actually do on your own. We are looking to increase conversion rates on pages that have high drop off rates. A benefit realized is that simple content/copy changes from the A/B Tasty editor can make improvements on conversion rates. "Very useful tool to better understand user experience by creating A/B Tests"
AB Tasty is a user friendly interface very easy to handle. To better understand the user experience, there are many features that help you improve your website by testing various scenarios before implementing them for real. It is a really good way to make sure you are developing the right optimization that will better your website experience. It is also a great tool to quicky make a slight change on the design, wording or other feature on your website before that change can be hard coded. Sometimes, it is hard to find in AB Tasty the element you want to change on your website because the code can be tricky and you need to be very comfortable with basics on HTML, CSS and JS. Depending on the CSS structure of your website some widgets are difficult to add to your pages. Thanks to AB Tasty we can discuss the design and UX choices that we want to make with a performance point of view. Before making a choice, we can analize different version before implementing directly on the website. It helps us make effective optimization and have a real impact on the conversion rate. We also use AB Tasty a lot with widgets in order to animate our marketing offers. 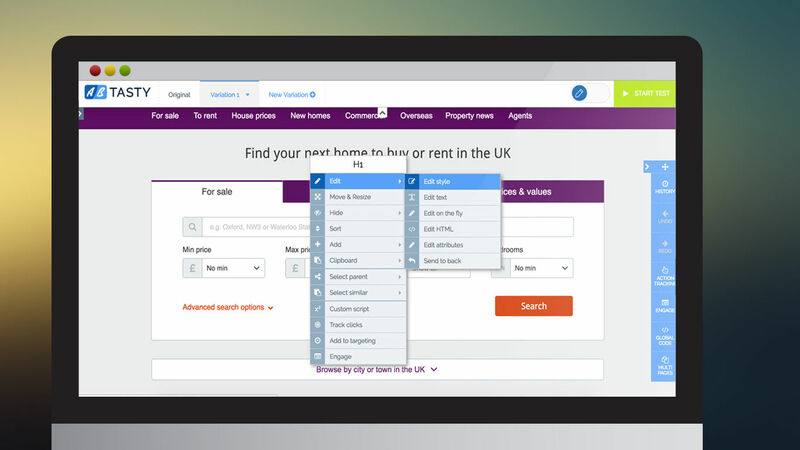 "Great platform with powerful features"
AB Tasty is a great platform with easy-to-use widgets for personnalisation and A/B testing. The platform is flexible and user friendly. There are many targeting options. The team is efficient, always available to help and give great insights to develop the roadmap. If you want to create major A/B test , you'll need support from the team or someone in your team that has a technical profil. The report dashboard could be improved. 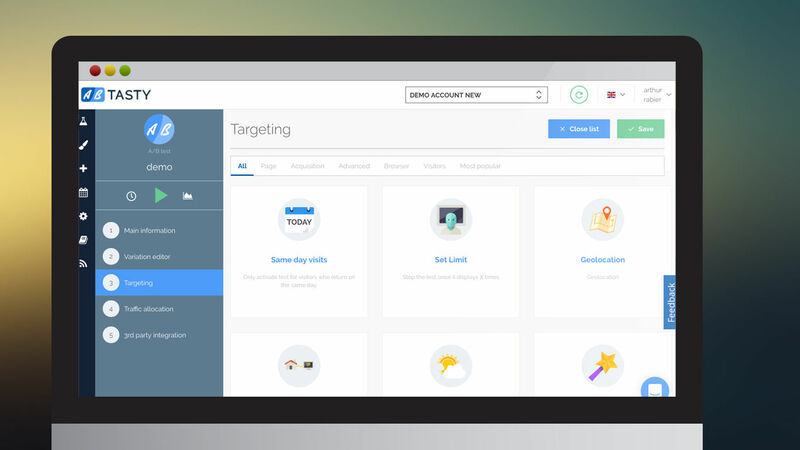 AB Tasty makes it easy to personnalize our website with CRM targeting thanks to the various connectors available. We found the widgets very interesting, you can solve something in just a few clicks, set the behaviour, UI of yur brand, CTA. We tryed most of them. Online editor es very friendly for marketers with no tech based knowledge. Costumer support is excellent. We solve the gap of time between development and testing, the personalization option it´s great for that. We can iterate fast, get results and make a continuos development of improvements. Our main goal is digital payments, using our mobile banking, we launch tests to increase traffic to the payments flow, and increase conversion inside that flow. We are increasing our conversion test by test. "Best partnership to drive CRO "
Support team: I have been exploring several A/B testing platforms and AB Tasty Customer Success Manager has provided the best support among potential partners. Very supportive and insightful, super happy with the partnership decision. Platform: Very intuitive and easy to use with a few clicks to set up the test and to understand the results. Love the visual editor to make quick changes and push to the site without having to wait a lots of time. China: The only AB Test platform so far which works in China without impacting the page load. Room for improvement for heatmap reports. "User friendly & easy to use ! " Really user friendly, easy to use & understand. Changing whatever we want on the website. Doing AB Tests that helps us to change the things we need! "Strong partnership and inspirationnal technology"
What I love with AB Tasty is that it is really easy to use. There is a lot of features that help marketers like me to improve our websites by testing various scenarios. Their teams are really helpful and I am very satisfied with my Customer Success manager, who is available and has a very good level of expertise. What bothers me is to have not enough time to explore and use the platform as much as I want. Give it a try ! It's worth it. We try to improve customer journey. Our main goal is to increase sales and income offering our customers the best user experience. "Great and Powerful tool, with a intuitive platform." During the whole process of A/B testing (road-map, brief, development and results), the AB tasty team is really supportive and helpful. All my questions & issues were answered & fixed very quickly. The platform is really intuitive and user-friendly. 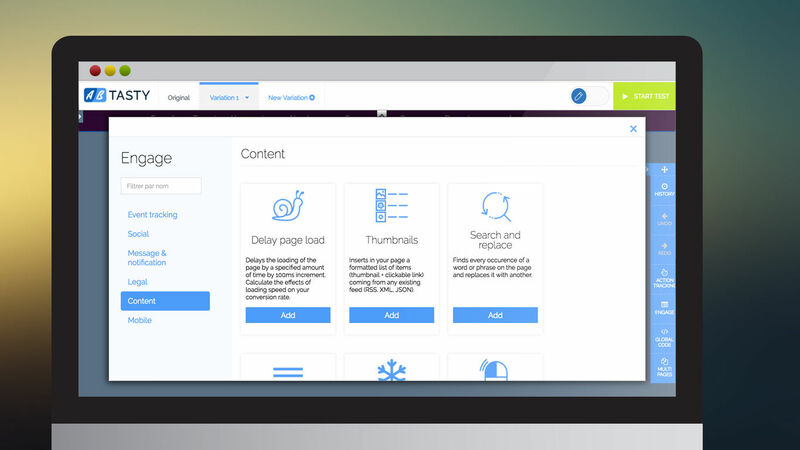 You can manage your campaigns very easily (edit, pause, play, reports and so on). You can do a lot of things with the plugins and also better understand your users with the Heatmap, NPS tool and the session recording. The platform is also constantly evolving with new features which shows that AB tasty does not rest on one's laurels. Other thing I like : The fact that we can launch A/B test through the WYSIWYG editor and without any intervention from IT. The fact that you need to clear your cookie, stop and re-launch the test if you want to QA your different variations. Except that, we are really satisfied about AB tasty. We resolved a lot of user experience questions. AB tasty helps us to understand our users behaviors and determine the best way to answers their needs. We definitely improve our UX with AB tasty. "A very useful tool to make product decisions"
Very easy to use and set up your experiments and a very proactive team to help us set up the complex tests. AB Tasty is a powerful tool to test your Business Hypotheses through continuous experimentation.